In the business world, the word, disrupt, is code for a trend-setter: A company that sets about making life, work or both more efficient with complete disregard for an old system, a system that everyone else hasn’t realized is old yet. However, there are certain challenges that pop up with the “Disrupter” designation. In some cases those difficulties stem from nothing having to do with business itself. For example, if you’re breaking ground as a new Start-Up, and you try to explain what you do to someone else, you have no one else with whom to draw a comparison. In other words, you may find yourself staring at some blank faces. It goes without saying that we at Office Divvy take immense pride in how we serve our entrepreneurial landscape in Flagler County and beyond, a traditionally under-served area in that regard. For us, being a disrupter means encouraging our clients to think differently about the ways in which they conduct their business. If you’re familiar with our company brand, you know we describe our company as a “Small Business Percolator.” In addition to being catchy, it’s easier to say that than to try to force ourselves into any existing niche of classification. This is because we believe Office Divvy has created its own unique category. That means it’s not always easy to translate all of our value-points—tangible and intangible—into a concise elevator pitch. People who’re close to us, but maybe at a slight distance from the business—mothers, fathers, friends, brothers, sisters, etc.—may turn white in the face when asked to explain what it is exactly that we do. Maybe they’ll give a brave and well-intentioned bungle. So when we were asked to be the cover story for the 2016 second quarter issue of Flagler County Chamber publication, Thrive Magazine (the Entrepreneur Issue in July 2016), we recognized what an opportunity that was. There’s a lot of great “splaining” to this article! We want it to be so much more than just a coffee table magazine for our friends in the local business community. That’s why we decided to upload all 3,000 + words of it into a blog post. Established in 2008, Office Divvy is a company serving the entrepreneur, Startup and small business community in Palm Coast, Flagler County and beyond. The company’s mantra is “empowering entrepreneurs.” And the team at Office Divvy does just that – empower entrepreneurs, by helping them start up, grow, and scale through their services: Co-location, call desk, Coworking, consulting and classes. When you are a Startup founder or an entrepreneur, the three big pain-points generally are location, staffing and reducing overhead. Choices you make early on often determine whether or not you can bear the most difficult period for a Startup: The first two years. According to Bloomberg, 8 of 10 entrepreneurs who start businesses fail within the first 18 months. Office Divvy has developed cooperative programs that provide a professional location, front desk team, and boutique call desk to its members so companies can start up, grow and scale without a big capital layout or committing to unnecessary overhead — hence addressing all three pain points for Startups. Take the example of a Startup that chose Office Divvy’s co-location and call desk services back in 2009 when they got started. One founder with two employees, literally starting out in a crowded and competitive industry. By making the choices they made, and choosing Office Divvy’s co-location and call desk services, the new Startup saved more than $40,000 the first year alone. There was no need to go and commit to traditional office space, or a phone system and the staff such a system requires. They outsourced those matters to Office Divvy. Four years later, that Start-Up company had reached over $100 Million in annual sales volume, and was acquired by a national corporation. START. SURVIVE. GROW. SCALE. EXIT. That lifecycle is truly any entrepreneur’s dream. In this particular case it materialized within just four years. Office Divvy is home to just under 100 companies co-located in a business-cluster all under one roof. The company provides a professional business location with full time front desk staff, mailing address, workspaces, offices and meeting rooms, where their members can receive mail in a commercial physical address, do their own solo-work in communal workspaces, or meet with their clients, vendors or their own team in private spaces. Understanding the value and power of Office Divvy’s co-location service often requires a paradigm shift. For many entrepreneurs having a full-blown business location with workspaces, meeting rooms, numerous amenities, and a community to plug into – with costs starting under $200 a month – is an aha moment. This is not only because the Startup founder is saving tens of thousands of dollars annually vis-à-vis traditional models (and most are) but because they can reduce the list of things that require their attention. A recent Wall Street Journal (WSJ) article, titled “The Surprising Truth Behind the Myth of the Lone Entrepreneur” debunks the image of the bold, do-it-yourself entrepreneur, finding that a misleading, romantic and deeply entrenched representation of what the actual data and case studies prove. Office Divvy offers not only modern ways to work that are commonplace across the country and internationally, but also the opportunity to create the type of entrepreneurial momentum the WSJ article proves. Office Divvy operates what the company refers to as ‘a high-touch, boutique call desk.’ That means the company has finessed their call desk operations in such a way that it allows for their call desk team to operate as an extension of the client’s team. Having a call desk to operate with a deep understanding of the client’s company culture, its founder’s vision and voice is a tremendous asset for any Startup or small business. By following their client’s business rules with true comprehension of best practices and expertise in human experience, the team at Office Divvy’s call desk positions the client’s company to deliver customer loyalty and satisfaction while saving thousands of dollars monthly. It’s easy to lose touch with an intimate customer experience – especially if all other aspects of the company are growing rapidly. The operation becomes about the daily grind, about fighting fires. So, when businesses attempt to solve this problem, they are dealing with one of the most inevitable pain points of entrepreneurship, that is learning how to not only grow their business, but how to scale it, too. The Office Divvy team ensures that each and every client is equipped to handle every customer call that comes their way so the business owner no longer has to stress over the hassle that comes with an increase in call volume or worry about resourcing a full-time call desk because of lack of funds, know-how, telephony infrastructure and architecture, accountability or training. Not only does Office Divvy’s call desk traffic calls and take messages (i.e. virtual receptionist), but they often perform tasks much like an in-house team would: CRM entries, inbound sales, appointment scheduling, or customer service. The lesser known advantages of an Office Divvy membership is in what the company provides beyond solving the physical needs of a company. As experts in customer experience and management, they help businesses narrow their goals, establish timelines and measure what is happening. Helping Startups with a lean, agile management approach to their business, sketching out how the business is working today, fine tuning workflows, creating a baseline, seeing what’s working and what’s not and helping companies pivot, are just some of the ways Office Divvy co-founders work collaboratively with their members. Today, Office Divvy members reflect a mix of Startups, entrepreneurs, remote workers, and owners of small and medium-sized businesses—spanning over twenty industries and six states. The first one is Startups. This is because Office Divvy’s primary focus is still on Startups. Whether they are in Ideation, Pre-Seed, or Early Seed phase, Startups are certainly loved and cherished by the team at Office Divvy! Youngpreneurs and Startup founders of any age, who have limited funding, typically fall into this first profile. The secondary profile is typically that of the Silverpreneur. The team at Office Divvy uses this term, Silverpreneur, to describe an entrepreneur who is typically 55 or older. That profile typically has achieved success previously, and now places an equal or higher premium to their lifestyle and quality of life as they do in their business. These clients often times want to have the freedom to focus on more than just their business. Outsourcing their location and phone services to Office Divvy is the perfect solution so as not to be bogged down with busy-work that comes with managing such operations. The last profile is brick and mortar companies outside of Flagler County who want to have a professional, commercial business presence here without the headaches. Killian’s Gutters & Screens is a major player in the Screen and Gutter business with thousands of home owners as satisfied customers in Flagler, Volusia, and St. Johns Counties. The Killian’s and Office Divvy relationship started began incrementally. First, letting Office Divvy answer phones one day a week, then two days, before finally handing over the reins. The collaboration has been extraordinary. Thinking through, documenting, and applying a world class scalable customer experience model has kept overhead down, increased revenue and enlarged the overall value of the business. “Thank you for calling Facial Flex, this is Jasmin, how can I help you?” …That’s our side. On the other end of the phone is usually a customer with a deep connection to their Facial-Flex®, an exercise instrument designed to help the user maintain a young face. This FDA registered Class 1 medical device is helping people build oral-motor strength against disease, disorder, or trauma, and has become a proven face, chin and neck exercise device for age-defying beauty results. Having a call-desk for what is otherwise an eCommerce company boosts sales. More importantly, how the Office Divvy call desk operates, and what they do with data and insights, positions Facial Concepts for what’s next — whether it’s new product editions, periphery products, new distribution, customer experience, you name it. Attracting entrepreneurs and the creative-class of content creators, coders, designers, technologists, and makers, to connect with and help each other is tremendously important for Flagler County’s future. The creative-class has different needs. When one is working from a laptop, work can be done anywhere—a home office, coffee shop or an actual office. Those options each have their own shortcomings, namely isolation and distractions. Coworking, simply defined as working independently, side-by-side, is the solution. A recent Inc Magazine article titled “2016 Will Be The Year of Coworking” lists 6 factors as to why more freelancers, Startups, and businesses are going the Coworking route: Business Connections, Shared Costs (reduced overhead), Increased Productivity, Professional Environment, Amenities, Flexibility. But hold on, add one more to that list: Coffee! Office Divvy was one of the first dozen Coworking spaces in the Unites States, but you will not find a future Office Divvy in a New York or a Chicago. You will instead find them in suburban and semi-urban areas. While Office Divvy is based in Palm Coast, Florida. But they have big plans to duplicate what they have built in similar markets regionally. There are three co-founders at Office Divvy. Most folks know Ky and Lisa. That’s because Ky and Lisa are the managing partners. Their third partner is Sim Taing, an enterprise software executive. He plays more of an advisor role. 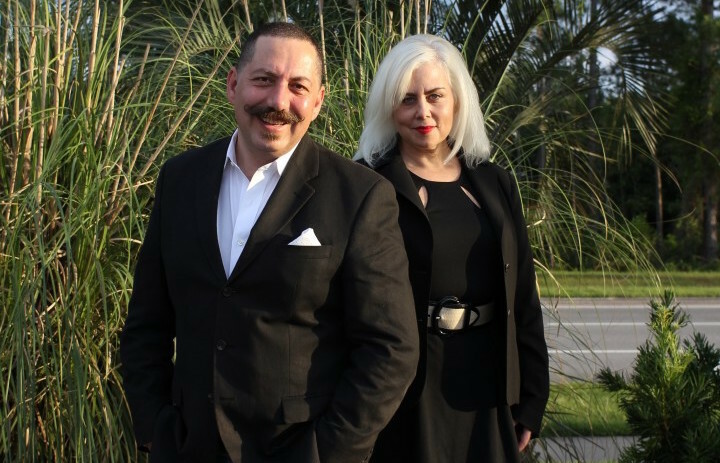 Back in 2008, as technology and business consultants all traveling outside of Flagler County to meet with clients, they knew there were interesting people doing interesting things locally; however, they did not know how to find and connect with these people. So they created a destination for entrepreneurs, Startups, Freelancers and Techies – a true business-hub that now attracts these interesting people. As a result, Office Divvy was born! Connecting entrepreneurs to one another is a core belief and mission for Office Divvy co-founders. They started Entrepreneur Night, a grassroots event for and by entrepreneurs, in 2011 for this reason. Event is held on the last Tuesday of every month–except July, August, December. The Entrepreneur Night events are more than simple occasions, they are creating a culture of Startups and entrepreneurship in Palm Coast, Flagler County and in our overall Central/Northern Florida. They have organized 46 of these events, for over 4 years, in 7 cities, with over 6,000 total attendees at 23 host venues. Events are attended by aspiring entrepreneurs, existing entrepreneurs and small business owners, and those in the business of supporting and serving entrepreneurs. Office Divvy also facilitated an entrepreneur pledge to be issued by the City of Palm Coast. According to Ky Ekinci that is the only known example of a City issuing a pledge to entrepreneurs in the entire United States. If leveraged correctly, this can position City of Palm Coast as a thought leader for entrepreneurship. Office Divvy also invests in the next generation by hiring and offering internships to high school and college students. In fact, the company’s digital team is made up of a mix of young junior associates and interns, whom the co-founders at Office Divvy are grooming for successful lives in the digital sphere. These students are content creators, coders, designers, writers – with intuitive minds, intrapreneurial spirits, and an intellectual vitality. All these young people are creative with their own unique strengths, all led and guided by Office Divvy co-founders Ky and Lisa Ekinci. They are building digital citizens. The Digital Team is learning essential 21st century skills, modeling what it means to have common sense, effective communication, critical thinking, and zero ambiguity – putting them ahead of the curve. These students are gaining knowledge and experience that most don’t acquire until they’re settled into their adulthood career. The Office Divvy Digital Team is working on incredibly interesting projects with their members: from responsive website designs and video projects to social network programming and anything in between. 14 students have moved through Office Divvy’s student internship program. Each forever changed by what they have learned about the digital space, business, and being relied on as a team member. Many have gone on to do extraordinary things after their Digital Team experience: pursuing college and higher education, cultivating their very own businesses, and landing amazing opportunities like attending Google’s summer institute. Office Divvy has hosted 68 classes, roundtables, workshops and events in the last 12 months. They offer topics that can typically be found in a New York or a San Francisco, from HTML and Coding Bootcamps, to Social Media Automation, REST API and Web Standards, Amazon Web Services Overview, Google AdWords Partner Sessions, iPhoneography, to Personal Branding Online and Offline…and more. Attendees can give themselves an hour to concentrate on one thing, and walk away with actionable learnings they can implement immediately. Classes are typically priced in $10 to $49 range, but Office Divvy members and clients can always attend them free of charge as one of the membership perks. Search for Flagler’s Most Interesting Startup. Is it you? Office Divvy’s latest special project is a contest developed to draw out those people doing interesting things and to help one of them (the winner) to get their project off the ground. Winner will receive one year’s free services from Office Divvy, mentorship, advise by subject matter experts in Law, Accounting, and Branding, plus additional resources and more, valued at $46,000. Visit www.OfficeDivvy.com or call 386-445-4153 if you’d like to learn more about the company and their services, or to schedule a tour of their Business Cluster and Coworking facility in Palm Coast.